A source claiming to be close to the publishers of the recently-launched Rage has told Kotaku that, at a recent "company wide" meeting held in Dallas, Bethesda and parent company Zenimax made the decision to "indefinitely postpone" development of Doom 4. Pete Hines, responding to our request for comment this morning, says no game in development has been postponed. "We don't comment on unannounced games and DOOM 4 hasn't been announced (though I appreciate that id has previously referenced DOOM 4)," Hines said. "Games are done when they are done and no title under development at id has been postponed – indefinitely or otherwise." Despite having been first announced back in 2008, Doom 4 has been on the backburner at developers id while work was completed on multiplatform shooter RAGE, which was released earlier this month to decidedly mixed reviews. While Crecente enjoyed it (and I'm digging it as well), the game's repetitive nature and numerous technical issues left it falling well short of many people's expectations. 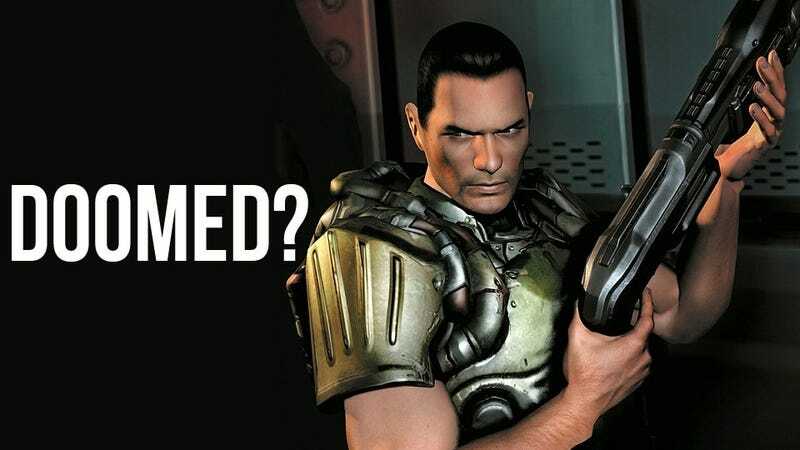 The apparent source says that Zenimax and Bethesda made the decision based on the "the issues and reviews" surrounding RAGE's launch, which in their eyes has demonstrated "a serious lack of confidence in the project management at id". Remember that, before you get too invested in this, at the moment the news is entirely unconfirmed. We've contacted Bethesda for comment and clarification, and will update if we hear back.